Unity Games has announced the release of Roadhouse Interactive’s FRS Ski Cross on iOS and Android, introducing players to the world of downhill skiing across more than 50 tracks. 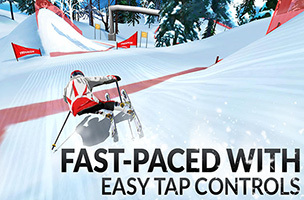 Gameplay is similar to that of a rhythm game, as players must tap or hold on the screen when skiers pass over colored lines during each race. Each slope comes with a different combination of corners and jumps. Players tap and hold on the screen to turn, tapping just as one red line appears and letting go when their player reaches the second red line. Jumps are activated by simply tapping when a blue line appears, with the timing of the tap relating to how well the skier turns or jumps. Slopes are timed, and players earn up to three medals on each course, along with money, depending on their performance. This money can be spent on over 250 pieces of gear, from faster skis to better helmets and pants. Each piece of equipment can offer different boosts, like an increase in top speed or jump and turn assists. As players upgrade their skier, they’re encouraged to go back and play previously completed courses to unlock medals they didn’t have the speed to earn before. Each race costs tickets to enter, which recharge for free over time or can be purchased with real money. FRS Ski Cross is now available to download for free on iOS and Android. Check back soon to follow the game on AppData, our tracking service for mobile and social apps and developers.